Other images throughout the post. Image should be 1400 in width, 72dpi. All must have a caption. More the better! Majority should span the entire width of the post, but verticals can be resized to be on the left side of the post. Social elements embedded (IG, FB, Twitter). Just paste the link to the content in the body of the story and a visual version of it will appear. Video embedded from YouTube. In the share options on YouTube, copy the embed code. 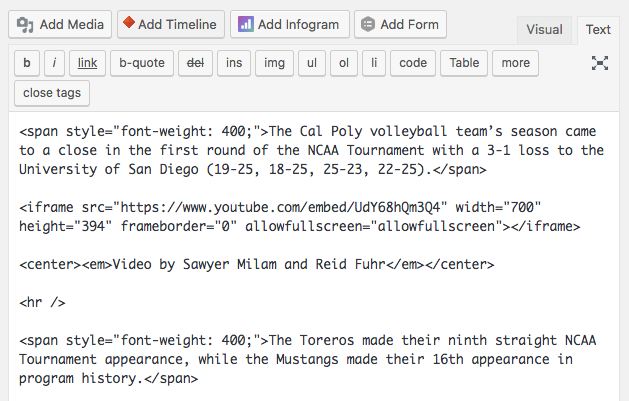 In the “Text” side of the WordPress editor, make a few paragraph returns where you want the video to be placed and paste in the embed code. Underneath the embed code, add a paragraph return and type in <center><em>Video by John Doe</em></center>. Then, put another two returns under that and type in <hr />. Finally, add another paragraph return to give the video two lines spacing on the top and the bottom of the video. Excerpt with a catchy subheadline in the except panel at the bottom of the post page. Tags create a archive page of all stories about a particular topic. Examples include “President Armstrong,” “Kennedy Library,” “PROVE Lab,” etc. Do not include tags like “Cal Poly” or items that apply to all stories or are too broad. Categories. Make sure to add “Top Stories” for it to go to the top of the site. All videos on Mustang News platforms must have matching graphics. Before starting, make sure to install the Proxima Nova font on your computer. Do this by double clicking the file and going through the steps to install the font. Please add the “MN Bug” throughout your entire video and put the “MN Outro” at the very end of your video (do not have the “MN Bug” over it). Also, if you are using courtesy photos or video, use the “2019 MN Courtesy” graphic for each piece.